I gave you a grade of A. Keep up the good work. I gave you a grade of A for the "Carter ammendments" to HR2454. Way to go John, keep it up and keep the pressure on. I gave you a grade of A after I saw that you are on the list of co-sponsors for HR1207. Congratulations! I just received and read the June 9 edition of your newsletter. Keep up the fight! I gave you a grade of A.
I gave you a grade of A. Texas is lucky to have ya'! I gave you a grade of A. I assume that you will not be endorsing confirmation of Sotomayor. I gave you a grade of A. Thanks for supporting HR1207. I gave you a grade of A. Keep up the good work. You evidently have struck a nerve with the Democrats. They don't like you very much. 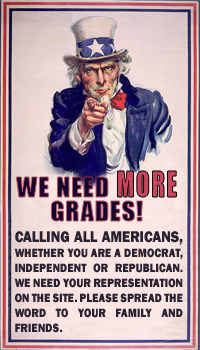 I gave you a grade of A. I am lucky to have a represenative who reflects my values. Keep up the good work.